This video contains as sample video of the DPRO-EC550VF2 taken in normal light and a zero light infrared night vision video as well. The DPRO EC550VF2 is a Dome Infrared CCTV Camera that could be use for some outdoor video surveillance applications and all indoor applications. This video will demonstrate the day and night capability of the camera via two video clips that were captured using it. First video clip was taken in our lab with all the lights turned on. The room is 20 feet long and a man approaches the camera to about 7 feet away. The lens of the camera has been adjusted to the widest angle so we could capture the entire room with a single camera. The night time video was captured with all of the lights off in the room and the door closed to create a zero light environment. The camera is built-in IR LEDs do a good job of illuminating this entire room. Here's the day time video one more time, and the IR night vision video one more time. The DPRO-EC550VF2 is in close in the IP65 weatherproof housing which means it can be used in mild outdoor application such as mounting the camera under the [heat 00:01:39] of a roof or in a warehouse with no air-conditioning or heat. This camera has a 2.8-12mm Vari-focal lens ans supports 600 TV lines of resolution. The ball style camera housing allows the camera to be ceiling or wall mounted without any additional bracket. For more information and to purchase this camera please visit www.cctvcamerapros.com/ec550. Thank you for watching. 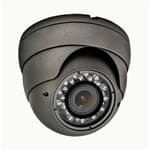 Click here to learn more about the DPRO-EC550VF2 IR Dome Camera used in this video.